For the second time in four years, a major fire has ravaged the Mackintosh Building at The Glasgow School of Art, one of Scotland’s architectural gems. 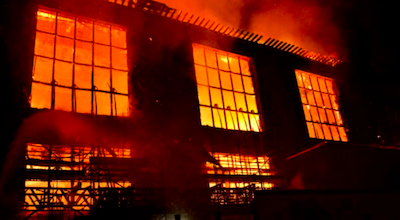 More than 120 firefighters fought the blaze late on Friday and early Saturday as it gutted the school and spread to a theater and a nearby night club. “The extent of the damage is very severe,” said Peter Heath, deputy assistant chief officer of the Scottish Fire and Rescue Service. Kier Construction Scotland is the Mackintosh Building contractor. He said it was too soon to determine the cause of the fire, which would be investigated. The fire was first reported about 11.20pm on Friday. On Saturday, the Scottish Fire and Rescue Service issued the following statement: “Around 50 firefighters are continuing to work to extinguish a significant fire affecting The Glasgow School of Art, O2 ABC and adjoining buildings. “Firefighters are presently concentrating efforts on all four sides of the buildings, from Dalhousie Street to Sauchiehall Street and into Renfrew Street. “The fire has now largely been contained however a few pockets of fire remain which crews are currently working to extinguish. “There are no reported casualties and nearby residential properties have been evacuated as a precaution. “The Scottish Fire and Rescue Service was first alerted to the fire at 11.19pm on Friday, June 15. “At its height, Operations Control had mobilised a total of 120 firefighters and 20 fire engines to the scene. SFRS Area Manager David Young, the officer in charge of the incident, said: “The fire has now largely been contained but this remains a protracted incident and our efforts very much continue at this stage to extinguish the fire and ensure the community is protected. “There will be disruption around Dalhousie Street, Sauchiehall Street and Renfrew Street and I would advise the public to avoid these areas at this present time. The Glasgow School of Art said in a statement: “A major fire started in the Mackintosh Building around 11.15pm last night, Friday 15 June 2018. “The incident is still ongoing and the site is currently under control of the Scottish Fire and Rescue Services (SFRS). “We are liaising closely with SFRS, with Kier Construction Scotland (the Mackintosh Building contractors) and both the Scottish and UK Governments. “SFRS investigations are ongoing and we are awaiting their outcome. “The Mackintosh Building has been undergoing a period of extensive restoration following the fire in 2014 and therefore has not been a part of the GSA’s operational campus for four years. “Whilst the fire in ‘the Mack’ is devastating news, The Glasgow School of Art’s immediate focus is on our students, and on the continuing operation of the GSA to ensure minimum disruption to students and staff. “The GSA and all of its buildings will remain closed for the next week, and we will provide updates as and when information is available. “We hugely appreciate the messages of support and offers of help that we have received from around the world. “We would ask that at this time any such offers should be sent in the first instance to development@gsa.ac.uk.